Cream of tomato soup is one of my personal favorites especially when it is 10 degrees outside. You can buy cans of cream of tomato, but I like to whip some up myself. The canned version tends to have more sodium than I like and it tastes a bit like the inside of a can. Now, this soup is made with canned tomatoes but somehow does not taste like a can. I am not sure why that is but if you have a few minutes to spare you can literally whip this soup up. My 10 year old daughter made this soup for me as part of a Girl Scout project to make breakfast, lunch, dinner, and dessert. She did it all by herself! When she picked the recipe, I thought it wasn’t going to work – too simple and not enough herbs for an umph. I ate the entire bowl and asked for more. It is goooood. If you can find really nice imported Italian tomatoes, I find that they have the best flavor. 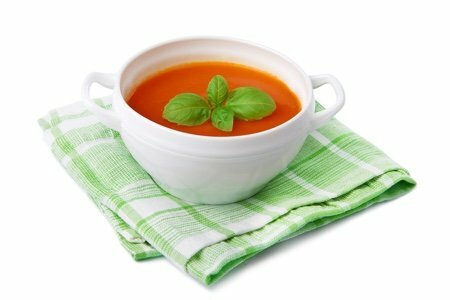 What is your favorite cream of tomato soup recipe? Pour the tomatoes into a blender and puree until smooth. Pour into a saucepan, pour in the milk and heat until hot. Add salt and pepper to taste and enjoy immediately. I ***love*** tomato soup and will definitely try this recipe! It's soooo easy! Thanks, Lisa!! Tomato soup, one of my favorite comfort foods. Will be made and enjoyed today. Just want to give a shout-out to Pomi Tomatoes, which come in a box, so they don't have the metal taste, but more importantly they aren't lined with toxic BPA. I've been really careful about this since I heard an interview with a food scientist where he said he would never eat tomatoes from a can in particular because the high acid level increases the amount of BPA in the food. Especially bad for kids, because it's a hormone disruptor. Hi Lisa, what type of milk did you use to calculate the 70 calories per cup? skim? 2%? Whole? Sounds great, and I want to make it with least calories possible. Maybe I can sip a cup whenever I'm feeling hungry! @Pam - it is calculated with 2% - but it isn't going to be that big of a difference to use whole milk. This is so light in calories that I wouldn't worry about it. I have a recipe I've used for years for creamy tomato soup that isosts $.64/cup and 87 calories, 3 from fat per cup. I could live on this soup all winter, I think. 2 - 28 oz jars drained diced tomatoes, any kind, the ones with basil are better, I think. *optional additions- chopped green onions, green chilies, ricotta or cream cheese or sour cream (all these will make it creamier), mushrooms. Put all but the milk products (cream etc) in a soup pot, bring to slow boil, add cream, stir and simmer for 10 min. We are a tomato loving household! Can't wait to try this recipe, looks perfect for a cold rainy day! My boyfriend and I went to Panera yesterday and had their tomato soup and it is so awesome, but as we were sitting there I couldn't help but think this has to be easy to make!! Thanks so much! I am really looking forward to making this! Love your site! Even I can do this one! Wonderful. I love tomato soup and have made it several times over the past weeks. Stir fry chopped onion, celery, carrots. Then add 2 cans petite tomatoes, last time I used oregano,basil,garlic ones,and chicken broth. Cook for 10-15 until tender, puree in blender/food processor. Then add milk. I even make croutons and put on top. This is sooooo good. I love tomato soup and so does my grandchildren. They will like even more knowing that Grandma has made it for them. Thank you. Can we use "Pureed" tomatoes? Oh I needed this simplicity! Wow! We had this for dinner tonight and it was great! Easy and delicious. Even my vegetable-hating toddler liked it! I added a dash of basil, oregano, and a clove of chopped garlic. Yum!